For new readers, every Friday it’s my pleasure to give away a card. The card goes to a randomly picked reader (worldwide) who leaves a comment in our conversation. Want to know more about Day of Giving, here’s a link to my FAQ’s just check out #11. You can check to see if your name is on the list of winners HERE – our winners list is up to date! For your comment: What objects do you look to for inspiration in your papercrafting. 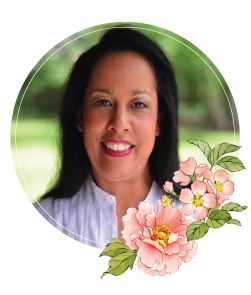 Thanks so much for taking a second to stop by – I sincerely appreciate it! Stay safe friends! Such beautiful details on your card! this sort of work SHABBY beats me lol !!!!!!!! Vintage yes. Hope you are safe from all the weather in your area. The objects I look to for inspiration are my ribbons, jewels and die cuts. It varies depending on what I have dream up in my mind. What a pretty “shabby” card! As always, you inspire me with your creative use of the dies tucked in and about. It just adds so much visual interest. You have wonderful ideas Becca. Every card gets better than the last. Bless you, Becca, for persevering! I especially love the muted colors in this card – just beautiful. I’m relieved to know that you weren’t forced to evacuate. I’m sure some of your readers were and my prayers go out to all those suffering due to Hurricane Matthew. I look to nature for inspiration for my cards and the fall season is one of my favorites. I don’t wear warm fall colors well but I can certainly dress up my cards with them! A very different card for you Becca, but oh so Beautiful!! ! You are Smazing! When I need inspiration, I just look around me and think of the color, shapes, and scenes that grab my attention…think on these a bit and usually come up with a card idea! I don’t use objects for inspiration, but places. Pinterest, YouTube and Blogs. Stamping magazines and books are also sources of inspiration. Oooh I am in awe how beautiful this card is. Your cards are always gorgeous, but this has to be one of my faves. I love your shanby side. I guess I look for inspiration in the paper I am using. Keep safe from the weather there! Oh my ! This card is so dreamy . I love it. I love lace and I love bows like you make that I still have not yet mastered. What do I look for in the way of inspiration, I tend to stick with romantic Victorian themes with Christian Values. But I like to also use Nature as in Mountains and water in my cards, too. I just purchased my first dies and embossing folders for my new Platinum 6. I cannot wait until after all my Specialist appointments and tests to have the chance to play with them! I bought Spellbinders Vines of Passion and Taylored Expressions At the Cross 3 Item # TE529. Spellbinders Embossing Folders M-Possibilities Flora EL-009, Four Embossing Folders from Darice-Bird Scroll Frame, Peacock (for our Vow Renewal),Fall Leaves Swirl and Snowflake Swirl. Then I also bought a Stencil to play in my Prayer Journal with -It is by TheCrafteersWorkshop.com Designs by Jaime Echt called Mini Birds of a Feather. It reminded me of the verse that tells me how much more God cares for me than many Sparrows and the book I read called “Uncaged”. Becca, Hope you are staying safe and not in harms way. I have been watching the news here on the west coast, and the hurricane looks to be reeking havoc for so much of Florida and along the eastern seaboard. Hoping you are not caught up in that. Your card is certainly a beauty. I just love the gorgeous lace. 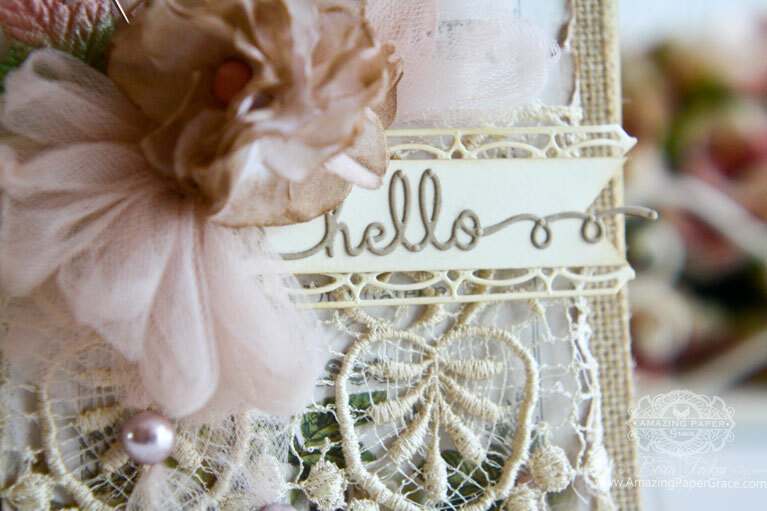 It adds so much charm and warmth to this card along with the burlap. Stunning. Oh my Becca once again you´ve done such an outstanding job on this fabulous card,. I LOVE Shabby Chic and this is everything one can dream of in that. Hi BI love a little touch of burlap too and shabby cards , so your card is a big hit with me , i always look to my Pinterest Card boards for inspiration . I am a loving this shabby chic look! Sooo pretty! It’s usually the intended recipient of the card who drives the inspiration for the subject, but sometimes I find a piece of paper that I just have to use! You shabby look is just lovely. Many objects inspire me but nature is a biggy, especially trees. Right now the Fall foliage makes me want to create. I do love your shabby chic cards with all the beautiful details! What a beautiful card today, I am later than you but I have a good excuse. Today, 8th October, is our Golden Wedding and we are having a wonderful time with our family. God has been good and nature provides me with inspiration. Hi Becca, I can sympathise, I have been having the same ‘internet’ problems, it is such a pain I know. 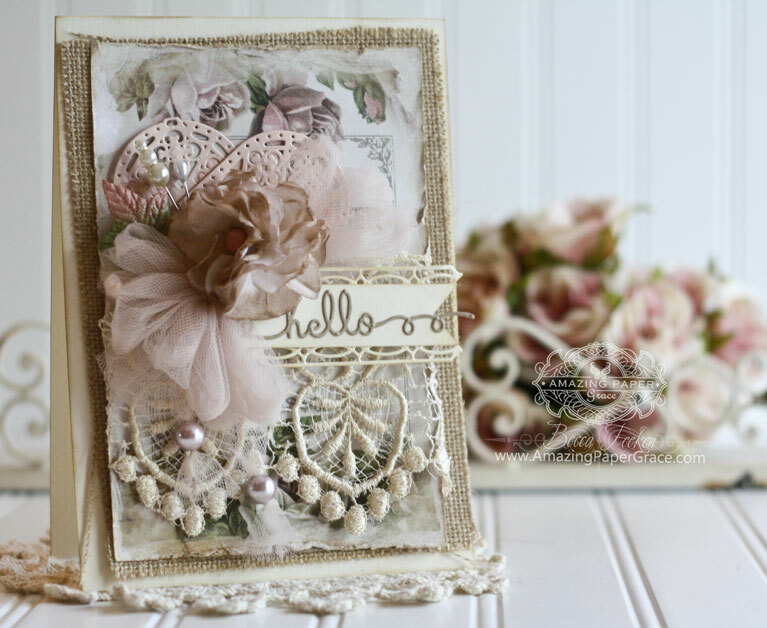 A fabulous shabby chic card, gorgeous !! Amazing card, so beautiful. What objects do I look to…well everything thats around me in nature I guess. I did not see my comment but remember F.Orinda was haVing a guest called Matthew!! Love the chic look of your giveaway card Becca ! The object I look for inspiration is your blog AMAZING PAPER GRACE-I never miss it a day. And always try to make a comment.